In 1877, French Impressionist painter Gustave Caillebotte painted a serious, top-hatted man and a dreamy-eyed, ruby lipped woman, whose arm links through his, huddling under an umbrella in Paris Street, Rainy Day. 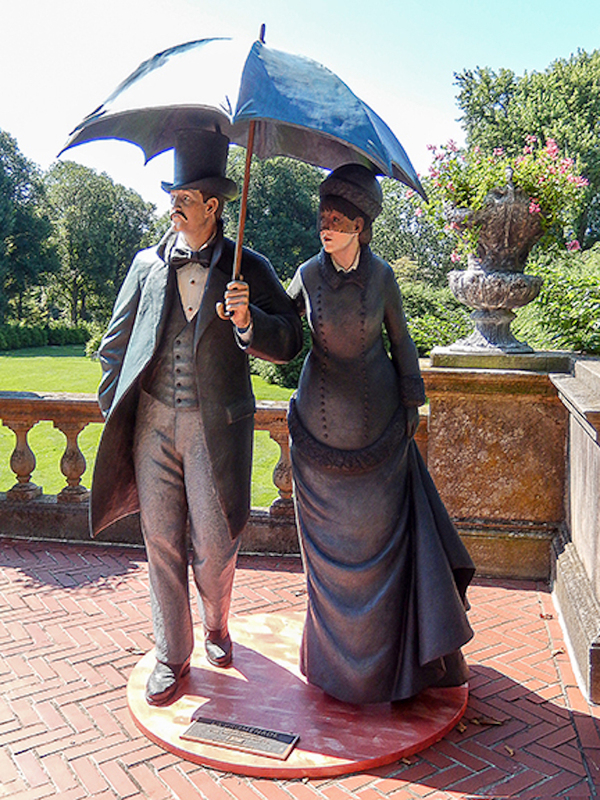 In 1999, contemporary sculptor, Seward Johnson, brought the couple out of the frame and out of the rain. 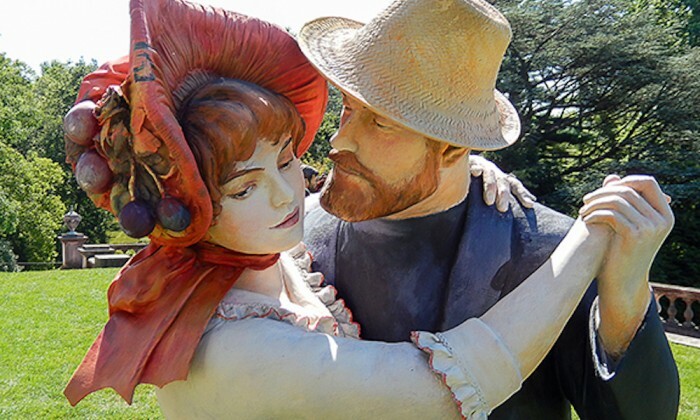 His La Promenade, a life-sized, meticulously detailed painted bronze recreation of the figures is one of some three dozen of Johnson’s renowned trompe-l’oeil (or trick the eye) sculptures on view in Experiencing Art in the Landscape at Old Westbury Gardens through Sept. 24. In the exhibition, the couple strolls at the edge of Westbury House’s patio. Just beyond them, on the lawn in front of the main entrance, three other couples dance. Far removed from music, time and reality, Whispering Close, A Turn of the Century and Time for Fun call to mind another realm. 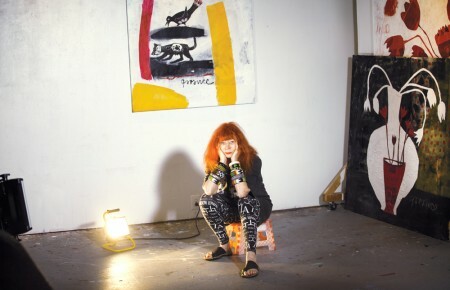 They’re Johnson’s homages to paintings by Pierre-Auguste Renoir. 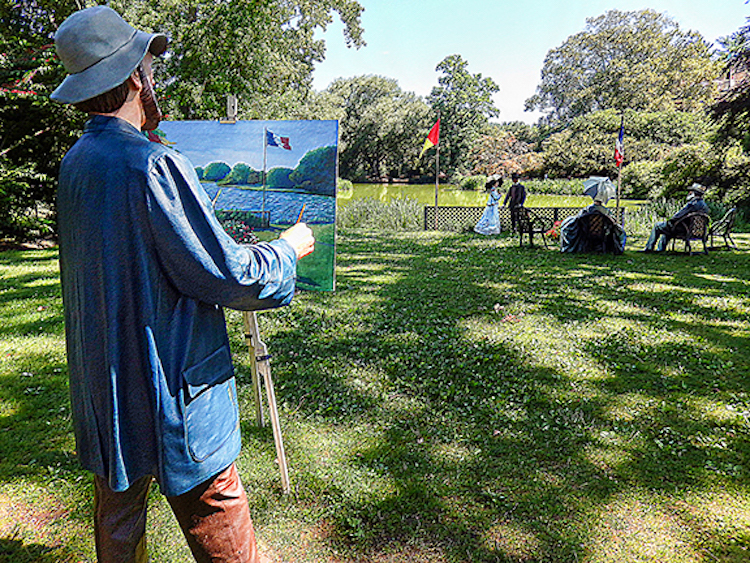 But unlike at the museums that house the Renoir works, at Old Westbury Gardens the public is invited to dance along with them, crowd close under Caillebotte’s umbrella and picture themselves as part of the composition, literally. The works on view at Old Westbury Gardens are from two of Johnson’s most popular series. 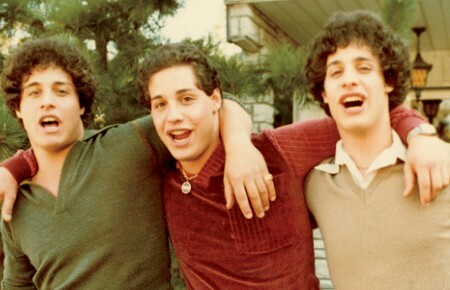 Celebrating the Familiar brings everyday moments to life, focusing on simple activities and pleasures. The subjects in these sculptures, wearing sundresses, cable knit sweaters, flip-flops and sneakers (all incredibly detailed in painted bronze) read books, go fishing, clip hedges and even take in the sights of the gardens. It can be challenging to tell from the distance of a few feet if the couple nearby is a work of art or other visitors. That’s part of the delight and amusement. Beyond the Frame is the title for a series of sculptures that recreate or are inspired by Impressionist and Post-Impressionist paintings. Monet’s work provides the starting point for several of the pieces incorporated into Old Westbury’s idyllic landscape. There’s a woman with a parasol and a windblown skirt next to a young boy. It’s Johnson’s On Poppied Hill, and it recalls Monet’s Poppy Field in Argenteuil and Woman with a Parasol – Madame Monet and Her Son, right down to the field of silk poppies installed around it. One of the most transportive and daydream inducing installations is near the garden pond. Amidst the sound of croaking bullfrogs, at a clearing between trees, an artist has set his easel. On closer inspection, it’s Johnson’s rendition of Monet, himself. In If It Were Time, the bronze figure stands, holding his paint-splotched brushes and palette as he faces a canvas. The painting (also a realistic recreation in bronze) is almost finished; the signature reads “Claude M” just awaiting a few more squiggles to complete the artist’s name. From the vantage point of Monet’s figure, the viewer looks down the hill to a group of figures sitting in rattan chairs. Two men and two women relax at the waterfront, a mound of geraniums and poles with fluttering flags framing the view. Those who know the Metropolitan Museum’s Garden at Sainte-Adresse will recognize it immediately. Like all the works in the exhibition, it’s an invitation to join in, to imagine oneself in a great work of art, or to see something familiar in a fun, new way.